for the base Google Earth image in the previous posting! cross-checked at the online "Earth 3D Map"
crosschecked at the online "Earth 3D Map"
We present here incontrovertible proof that the original ground plan of Abydos and its associated predynastic funerary significance was astronomical viz. (for religious purposes) "heavenly" viz. "heaven-centered" in nature. As we have deciphered in past postings, the Processional Valley at Abydos marks the (tail) stars of Draco and ends at the North Celestial Pole. Are there any stars marked there on the ground in hermetic fashion, i.e. "as above, so below"? 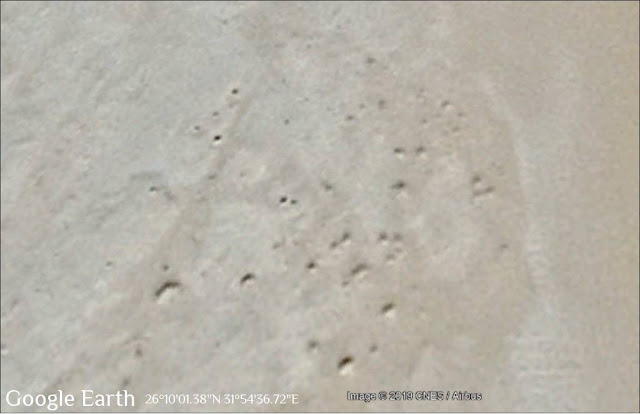 The round objects are like "tumps" or similar markings on the ground. What caught our eye particularly in the above image were the group of tumps on the ground in an "eye-shape" towards the center right, a figure comparable to star positions that we recognized (26°10'01.38"N 31°54'36.72"E). Were those the positions of some stars near the North Celestial Pole ca. 3000 BC? The image below is a clip from Starry Night Pro of the possibly comparable stars represented by the Abydos image above. 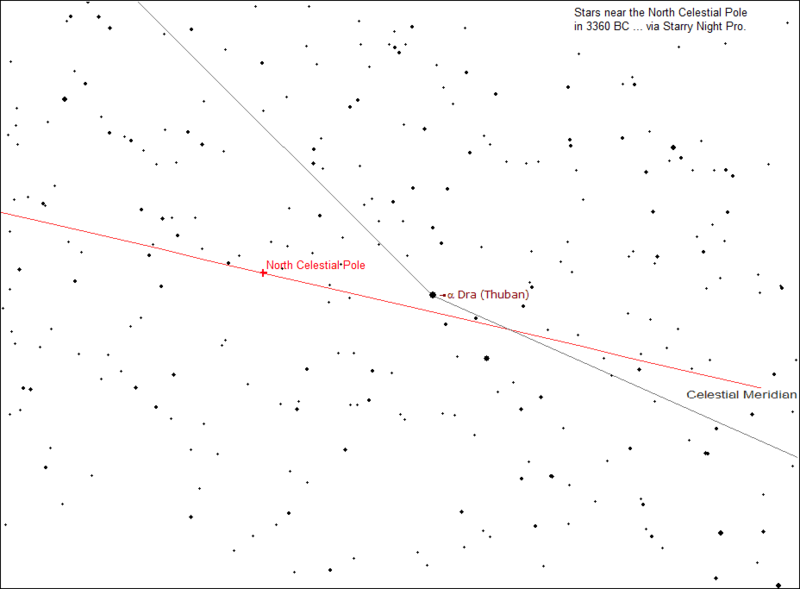 See if you can find an eye-shaped comparable figure in these stars, just below the North Celestial Pole in 3360 BC. Now look at the Abydos ground plan next to the allegedly comparable stars. Is that a match? ABSOLUTELY. We post these materials online, by the way, because we are interested in how the historical past of humankind actually was, and not how it is erroneously portrayed by errant mainstreamers, who are on the wrong path. We have little hope of reaching the minds of financially established academic researchers in these fields because their minds are apparently closed and their pocketbooks full. God forgive them. "Pocketbooks" is used here in the broader sense to include things like "academic reputation" and the "years invested", all of which people are of course unwilling to give up by changing their course. We DO reach out however to new, young minds in historical fields who are at least willing to consider astronomical solutions in their researches. You do not have to agree, but you should at least LOOK. LOOK. The probative evidence for the importance of astronomy to prehistoric humankind and the instances pointing to "heavenly" veneration of the stars by ancient cultures is overwhelming ... OVERWHELMING! Religion did not start in a day and God is "in heaven" and not elsewhere for a reason. The ancients revered the starry sky and that is where they put their gods. It took thousands of years for our modern "heaven-oriented" beliefs to develop out of that. Why is this probative evidence ignored? P.S. We continue on, nevertheless. Do you see the profile of a Pharaoh-like person (with elongated beard) in the background of the Google Earth image above, facing right? There are more such man-made "figures" at Abydos. We shall present them in subsequent postings. Question: Why have we titled this posting "Abydos Boats, Umm El-Qaab, KKB, Kochab, Stars, Cepheus, Ursa Minor, Ursa Major, Cassiopeia, Draco and the Mother of Pots of Mainstream Bad Archaeology Lost in Yesteryear"? Answer: Because the ancient predynastic Pharaonic Egyptian funerary site Umm El-Qaab epitomizes the wayward wrong path that mainstream Archaeology and related disciplines have been taking since their inception in their misunderstanding of the nature of the early history of Ancient Egypt. The historical disciplines, lost in pots, have totally missed their boats, as it were, by failing viz. refusing to ask the simple question of whether much of what has been found in prehistory could be related to ancient religious beliefs as tied to the veneration of the stars above -- "in heaven" as it were. According to current mainstream dogma, the name of Umm El-Qaab viz. Umm El Gaʻab, is (erroneously) traced to the Arabic term qa-ab "small bowl" and thus the site name is transliterated "Mother of Pots" because of all the ancient pot sherds found in the area and purportedly arising from offerings to the gods. But why here? People in Egyptology call their current view "science". We call it "folk etymology" and unsubstantiated guessing. Hebrew in Its West Semitic Setting: A Comparative Survey of Non-Masoretic Hebrew Dialects and Traditions. Part 1. A Comparative Lexicon Volume 3 Sections Bb. Root System: Comparative Material and Discussions. Sections C, D and E: Numerals under 100, Pronouns and Particles, Hebrew MaterialSeries: Studies in Semitic Languages and Linguistics, a massive work described as "This ... lexical part of the work ... contains comparative material to the root system from cognate languages, including sixteen Semitic and three Cushitic fairly well represented languages as well as Tuareg, Hausa, old Egyptian and Coptic quoted systematically; Omotic; Berber other than Tuareg, and Chadic other than Hausa likewise as groups; other Semitic and Cushitic less regularly; etymological and semantic comments follow dictionary entries; phonological discussion, including an attempt at the determination of pre-Semitic phonemes on the basis of actual attestation, is mainly concentrated in the introduction...."
"Phoen /kkb/ star; Ug /kbkb/ (pl. /kbkbm/, /kkbm/) =; Aram /kowkb/ = ; Syr /kawkb/ = ; Amor /kabkab/ = ; Akk /kakkab/ = ; Arab /kawkab/ =, constellation; ESA /kwkb/ star .... Etymology uncertain; Aram etc. /kbb/ seems to mean primarily roasting rather than just burning...."
The above term has its Indo-European comparable, e.g. Latvian kūp- kūpt, written by Mühlenbachs-Endzelins as kûpt, kûpstu, kûpu meaning "qualmen, dampfen, rauchen" ... with the variants kvēp-, kvēpu "qualmen, rauchen". In English the best translation is perhaps a "fuming fire", as the ancients apparently originally viewed the stars, i.e. as red-hot wood-burning campfires. 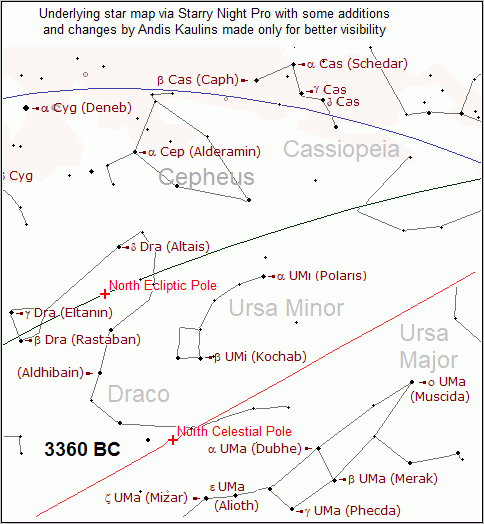 ... we can now view that central portion of the starry sky in a larger context at Abydos as follows, demonstrating that Umm El-Qaab marks the stars of Ursa Minor (with Qaab arguably specifically equivalent to Kochab) ... the curving Processional Way marking the stars of Draco and arguably the North Celestial Pole. In addition, the stars of Ursa Major and Cassiopeia are also marked on the ground surface in hermetic fashion by edifices, i.e. "as above, so below". 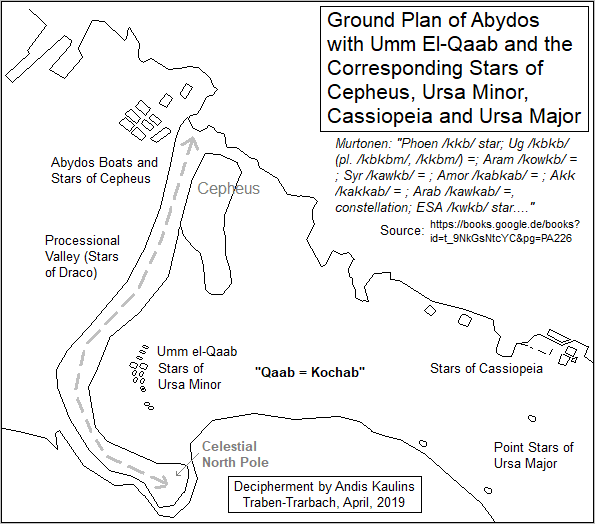 Here is our composite decipherment of Abydos and Umm El-Qaab as marking the stars at the center of heaven and thus being the funerary center of predynastic Egypt. There are three images -- 1) the ground plan, 2) the corresponding stars, and 3) the composite ground plan and sky. We thus do not have the banal "Mother of Pots" at Umm El-Qaab, as the pot-geeked archaeologists and related professions would have us believe, but rather, we have the "Father of Fumes", as it were, the Midheaven of Stars. Since the astronomical nature of Abydos is thus made quite crystal clear by this decipherment, all the disciplines involved in trying to understand mankind's ancient history will have to abandon the misunderstood paths they have been following up to now, and will now have to follow the true hermetic path, "as above, so below". That is the origin of our (humankind's) "heavenly" beliefs, indeed, long before the Pharaohs.